I have a number of fountain pens. I find I enjoy writing more when using a fountain pen. My favorite pen, without a doubt is my Mont Blanc Meisterstuck 149. (BTW the Mont Blanc website is technically very cool, but don’t go there on a dial up connection.) 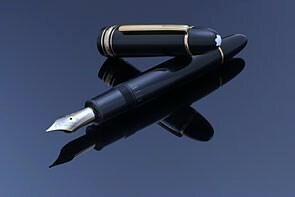 There is nothing that writes like the Mont Blanc 149. I’ve written the first draft of every major motion or brief I have ever done in longhand with my 149. They aren’t cheap, but I sure as heck think mine is worth it. (Of course, I got mine as a gift) Get one. I recommend it.